A collection of bitcoin tokens stand in front of an illustration of binary code in this arranged photograph in London last month. In Indonesia, fintech startup Blossom Finance uses Bitcoin to help Muslim entrepreneurs and small businesses by offering microfinance services. With the growing utilisation of fintech in the Islamic finance sector, the question arises what role digital currencies and blockchain technologies play in Shariah banking and – most of all – whether they are halal or not. This is such a new topic that not much had been released on it from Islamic scholars, and there is no official position yet by large Islamic finance organisations. But there is an increasing number of financial service companies that start using such modern technologies in a quest to tap the potential of particularly younger Islamic investors. 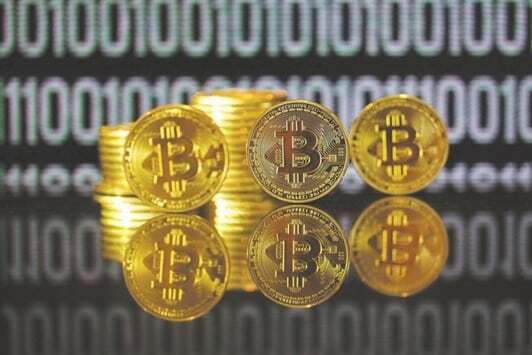 For example, Toronto-based company Goldmoney Inc, which just recently certified its gold-based financial products as Shariah-compliant by implementing the newly announced halal gold standard, is the latest firm to utilise blockchain technology for Islamic finance transactions. In Malaysia, HelloGold launched a Shariah-compliant online platform that uses blockchain, allowing for more direct transactions and lower costs to give the company access to millions of Muslim customers around the region. In Indonesia, fintech startup Blossom Finance uses Bitcoin to help Muslim entrepreneurs and small businesses by offering microfinance services. Blossom Finance collects capital from investors all over the world and provides the funds to microfinance institutions for investments by using cost-saving Bitcoin transactions. After an annual cycle, the company distributes profits back to investors. And the list continues. Blossom Finance is a good example to illustrate why Bitcoin and related blockchain transactions fully comply with Shariah finance. First, Blossom’s risk-sharing business concept is built on Mudaraba, does not collect or distribute interest and does not invest in haram industries. And this is supported by using Bitcoin, through which global transactions are becoming completely transparent, says Blossom Finance founder and CEO Matthew J Martin. However, some scholars have pointed out that if Bitcoin is seen as a currency like any other, then Shariah rules with regards to currency trading need to be obeyed. According to most stances within Islam, currencies can only be exchanged in spot transactions and not with delays which would constitute speculation; and the same principles would apply to digital currencies. Another issue that Muslim people have with the concept of digital currency is that there is no physical representation of Bitcoin, at least not in tangible form although its existence proves itself when a transaction is made because value is generated. Those who study Bitcoin’s relation with Islamic finance are quick to explain that the cryptocurrency’s “intrinsic value” comes into play. Since the laws of Islam require halal currency to have such intrinsic value and to be backed by an asset, digital currencies seem to fit that requirement perfectly. Compared to paper money, which just has an agreed-upon value and the real value (of the paper) is close to nothing and which is prone to damage, loss, theft and illegal duplication, Bitcoin’s intrinsic value cannot be modified in any way. Moreover, Bitcoin and other digital currencies are considered asset-based as opposed to the fiat monetary system in use today in conventional finance which is debt-based. The majority of today’s fiat money is created in the form of loans from within the banking system, whereby Bitcoin is created in limited volume through a mining process with actual computer power and does not involve debt creation, seen by some as “digital gold.” Thus, it can be described as an asset class and this fits well with the principles of Islamic finance. It has even led some Islamic scholars to express the view that Bitcoin and similar cryptocurrencies are actually “more halal” than paper money because of the lack of debt and the fact that blockchain-technology based transactions owing to their crowd character represent the risk- or profit-loss sharing principle of Islamic finance far better that paper money transactions since there is also no investor-borrower control as with normal financing. While in the analogue world most of Islamic banking transactions involve profit-and-loss sharing contracts, Blockchain transactions are based on smart contracts through the blockchain process which makes Bitcoin & Co an ideal Shariah-compliant financial tool.